In the following excerpt from The Liberating Secret, Norman unveils through the Book of Romans the three stages by which God reaches out to blind and hopelessly self-confident man--according to his … continue reading. Question: Recently, I have been faced with a difficult situation and have been trusting that God is in it for His good purposes. But I am not at peace about it and have been assaulted by fear and … continue reading. Part Three We continue our excerpts from Page Prewitt's booklet, copies of which are available from Zerubbabel Press. Crucified with Christ--What Does It Mean? I think it would be helpful to … continue reading. 12.21.83 Janet my dear, I wish I could enjoy that hug but that must still wait; but I do indeed enjoy your love in sending such a gift, and such a size. Thank you, dearest, very much, and it is … continue reading. We dislike a person, so we take a leap of faith. We move over and say, "I don't like this person, but You are love in me. You love him, so with Your love, I love him." Switch on the light, and where … continue reading. "Through the law I died to the law so that I might live for God." Galatians 2:19 (New King James) The law given by God to Moses in its outer written forms, underlining the outer standards of … continue reading. 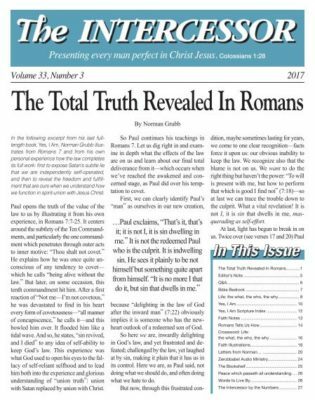 In this issue of The Intercessor we dive right into some of Paul's weightiest topics. In our lead article, "Roman's Seven Puts Me Straight," Norman Grubb references Paul in answering what it means to … continue reading.